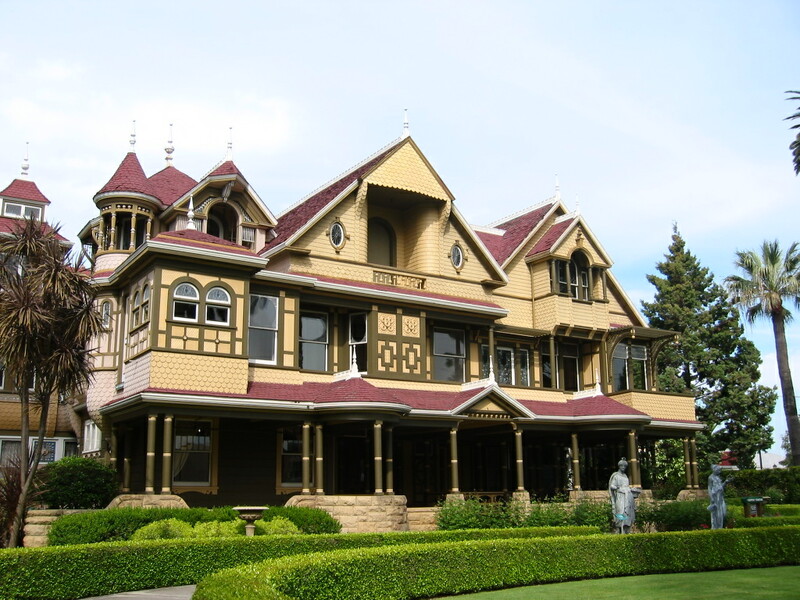 Visit the World Famous Winchester Mystery House! Everyone has seen strange houses before in their life, whether it had to do with the architecture, design, or landscaping. Arguably, one of the strangest houses that exists today is the Winchester Mystery House located in San Jose, CA. The house was built in the late 1800s and is known for having stairways that lead to nowhere, dead ends, secret passageways, and upside down columns all designed by Sarah Winchester. If you like mysteries and will be staying in one of the hotels around Mountain View CA, then come visit one of the strangest attractions in San Jose. So who was Sarah Winchester? She was brought up in a wealthy family and later became the wife of William Winchester, whose family owned Winchester rifles. After her infant daughter died of marasmus followed by her husbands death from tuberculosis” Sarah moved from Boston to the Santa Clara Valley. It is believed that Sarah sought the help of a medium after her husband’s death who said that her family was being haunted by the spirits of those who had died at the hands of a Winchester rifle. According to legend the medium told Sarah she must move West and build a grand house to appease the spirits. If she built a grand house and never stopped construction ” she would save herself from the same fate met by her daughter and husband. So Sarah did just that. Sarah Winchester never stopped construction on her beautiful Victorian home. It is believed that she created stairways that led nowhere and dead ends to confuse the spirits. Today” visitors can take various tours of the Winchester house the grounds the basement and the gardens. Get a look inside 110 of the 160 rooms that make up the mansion. You will see things like a window built into the floor doors that open up into walls and a chimney that rises four floors. The house is a true maze. ” so be sure to stick with the group! Bring the whole family to see the strange and mysterious Winchester House!